Full Series of Rugged Tablet PC available now! Winmate has now a Full Range of Rugged Tablet PC's from 8.4" / 10.4" / 12.1" and 12.1" Wide LCD Size. With this Series, Winmate become one of the widest product range suppliers in the Rugged Tablet PC Market! After Winmate launched in summer 2008 our 10.4" Rugged Tablet PC, we keep developing and widen our product range to enlarge our product portfolio. With this step, our worldwide customers can choose whatever size for their specific applications, form one supplier only! 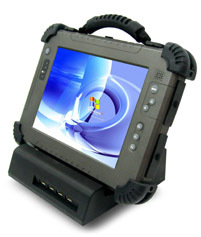 Most Rugged Tablet PC manufacturers have a very limited selection of Sizes and or Features. We have any Size, any feature you like, we do customizing even for small quantities, and we do from Industrial- to Military- and even Aviation-Grade! We do, what ever you need! Ask us, we will proof it to you! With our outstanding hardware and software technology for mobile tablet PCs, Winmate has build a rugged series of Tablet PCs from entry level to high performance. From Via to Intel, from small to big size, any option built-in or any accessory, we can make it! With our wide range of accessories, cost effective options and market-proofed quality with ISO 14001, fulfilling with our products MIL standards, there is nothing left as to order your sample and test it yourself!